At the United Nations Sustainable Development Summit on 25 September 2015, world leaders adopted the 2030 Agenda for Sustainable Development, a set of 17 Sustainable Development Goals (SDGs) to end poverty, fight inequality and injustice, and tackle climate change by 2030. The SDGs build on the Rio+20 outcomes and the Millennium Development Goals (MDGs), eight anti-poverty targets that the world committed to achieving by 2015. The SDGs are universal, meaning they apply to every country in the world. Local and regional governments played an important role in influencing the definition of the SDGs, successfully campaigning for a stand-alone goal on Sustainable Cities and Human Settlements (SDG 11), and for international recognition of the pivotal role of local and regional government in sustainable development. The Global Taskforce of Local and Regional Governments was set up in 2013 to bring together and coordinate the joint advocacy work of the major international networks of local governments. The Global Taskforce has participated actively in the SDG and Habitat III processes, and has brought the voices of local leaders to the international debates on financing for development, disaster risk reduction and climate change. The roadmap is not a prescriptive â&#x20AC;&#x2DC;how toâ&#x20AC;&#x2122;; rather, it covers a range of strategies that can be adapted to the specific contexts and needs of different cities and regions. 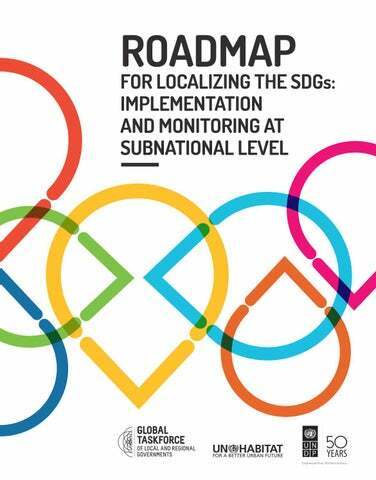 The roadmap is part of the Toolbox for Localizing the SDGs, which aims to support local and regional governments and other local stakeholders in implementing the 2030 Agenda at local level. The toolbox provides concrete tools, and practices to: I. Raise awareness and advocate for the active role of local actors in the localization of the SDGs II. Support them to make decisions that contribute towards the achievement of the SDGs. The toolbox is currently being drawn up by the Global Taskforce, UNDP and UN Habitat. Who is the roadmap for? This roadmap aims to support local and regional governments and their associations to implement and monitor the SDGs and to influence national policy-making with a view to creating an enabling environment for action at local and regional level. The roadmap will also be a useful resource for national policymakers, international organizations, civil society organizations, academia and anyone involved in the implementation and monitoring of the SDGs. The SDGs at a glance The Sustainable Development Goals (SDGs) are an ambitious set of 17 goals and 169 targets that were defined and developed through an unprecedented dialogue among UN Member States, local authorities, civil society, the private sector, and other stakeholders. What does “localizing the SDGs” mean? The 17 SDGs and 169 targets of the 2030 Agenda must be achieved at global, national and subnational levels. “Localizing” is the process of taking into account subnational contexts in the achievement of the 2030 Agenda, from the setting of goals and targets, to determining the means of implementation and using indicators to measure and monitor progress. Localization relates both to how local and regional governments can support the achievement of the SDGs through action from the bottom up and to how the SDGs can provide a framework for local development policy. SDG 11, on sustainable cities and human settlements, is the lynchpin of the localizing process. Its inclusion in the 2030 Agenda is the fruition of the advocacy work of the broad urban community (particularly local and regional government associations) and is also thanks to the growing international recognition of the importance of the subnational dimension of development. Linking SDG 11 up with the urban dimensions of the other 16 goals will be an essential part of the localization of the SDGs. Why does localizing matter? While the SDGs are global, their achievement will depend on our ability to make them a reality in our cities and regions. All of the SDGs have targets directly related to the responsibilities of local and regional governments, particularly to their role in delivering basic services. That’s why local and regional governments must be at the heart of the 2030 Agenda. UN Secretary General, Ban Ki-moon, sent a clear message in this regard, recognizing that, in a rapidly urbanizing world, “our struggle for global sustainability will be won or lost in cities”.1 Cities and regions are ideally positioned to transform the broad and abstract 2030 Agenda into a concrete and efficient one. They can approach goals and targets in a pragmatic way, fit them into their own particular context and help their citizens understand how local action contributes to their achievement. Since the UN Conference on Environment and Development in Rio de Janeiro, Brazil, in June 1992, local governments and civil society have gained a wealth of experience on how to translate the Agenda of Rio into practice at local level. More than 6000 Local Agenda 21 initiatives in 113 countries have demonstrated, in their own way, how to raise awareness, advocate and practically implement the Agenda 21 in their communities. The achievement of the SDGs depends, more than ever, on the ability of local and regional governments to promote integrated, inclusive and sustainable territorial development. As stressed in the Synthesis Report of the UN Secretary General,2 “many of the investments to achieve the sustainable development goals will take place at the subnational level and be led by local authorities.” National legal and political frameworks still have a long way to go in recognizing this, and national and international advocacy work on behalf of local and regional governments remains necessary. This roadmap builds on the consultation on localizing the post-2015 development agenda, which was co-led by the Global Taskforce of Local and Regional Governments, UN-Habitat and UNDP in the summer of 2014.
are essential for promoting inclusive sustainable development within their territories and, therefore, are necessary partners in the implementation of the SDGs. the inclusion of a diversity of local stakeholders, thereby creating broadbased ownership, commitment and accountability. •	An integrated multi-level and multistakeholder approach is needed to promote transformative agendas at the local level. •	Strong national commitment to provide adequate legal frameworks and institutional and financial capacity are required. The role of local and regional governments in increasing citizen understanding and ownership of the SDGs National and subnational governments, civil society organizations, the private sector, academia and individual citizens should all be involved in the implementation and monitoring of the SDGs. Awareness-raising campaigns should be carried out at both national and subnational levels, mobilizing and building partnerships with different local stakeholders, bringing together all sectors of society, boosting their participation and ensuring that diversity is embraced (drawing knowledge, legitimacy, participation and enhanced effectiveness from local people of all cultures, genders and origins). As the closest level of government to the people, local and regional governments are well-placed to raise awareness about the importance of the SDGs and their relevance to local communities. Subnational governments bridge the gap between central governments and communities and should play a strong role in fostering the involvement of civil society organizations, the private sector (micro, small and medium enterprises), academia and other community-based organizations. Locally elected leaders, in particular, have a democratic mandate to lead local development and can be held accountable by citizens if they fail to do so. Such democratic accountability is a powerful tool to drive the achievement of the SDGs at local level. Awareness-raising activities should aim to increase the engagement of citizens and local communities in order to promote their sense of ownership of the Agenda and their participation in the achievement of the SDGs at local level. But awareness-raising is not only about letting citizens know about the existence of the SDGs. It is also about empowering them to participate in the achievement of the SDGs in their daily lives. Municipal and regional governments should be supported to recognise the 2030 Agenda as a framework for action, and set up mechanisms that enable citizen participation and institutional accountability. Has recognized the importance of involving local authorities and civil society organizations in the achievement of the 2030 Agenda. That’s why the institution is setting up an alliance of cities and NGOs and conducting awareness-raising campaigns on the SDGs with universities and schools so as to “convert this initiative into a national project that starts with education.”4 In addition, measures are being taken to promote consistency of policy among the different government departments so that they include the SDGs, not only in their development cooperation strategy, but also through the adoption of a new law and policy that involves the government as a whole. The Global Goals Municipal Campaign in the Netherlands About half of the municipalities in the Netherlands participate in the campaign: they communicate and raise awareness about the SDGs, facilitate the participation of local stakeholders, examine their own policies to align them with the SDGs and exchange practices with other municipalities both within and outside of the Netherlands. The international cooperation agency of the Association of Netherlands Municipalities (VNG International) has drawn up a ‘Menu of Inspiration’, which provides ideas to municipalities on the actions they can take for each of the SDGs. Through a ‘Time Capsule’, which is traveling around the country, mayors and their populations, schools, municipal councils and other stakeholders, express a wish for 2030 and thus engage in a dialogue on what the municipality needs to do to achieve a sustainable future. The campaign also encourages exchanges between municipalities through regional meetings and opportunities for international cooperation. Lastly, the campaign undertakes negotiation and advocacy towards national ministries, as well as working with large companies, development and environmental organizations. Local and regional governments in those countries where the MDGs were pursued should build on networks and organizations that were involved in the MDG process, as well as on the Agenda 21 programme and sustainable development strategies. At the same time, they should also use the SDGs as a fresh start to engage with a broader cross-section of actors, such as the private sector and community organizations, and to launch new forms of collaboration and participation. Public awareness-raising campaigns should focus on the message that the SDGs are relevant to ordinary people all over the world. The SDGs cover issues that are directly relevant to citizens’ daily lives, including vital challenges such as poverty, gender inequality, climate change and insecurity, as well as public goods like education, health, water, energy, air quality, housing and the conservation of natural resources. Activities that can be undertaken to raise awareness among the population should make the SDGs engaging and harness the power of local culture. Such activities could include concerts, bike rides, campaign buses, fairs, events showcasing success stories, award ceremonies, and collaboration with well-known figures (e.g. : actors, musicians, sportspeople, writers, and photographers) or foundations that can act as ambassadors for the SDGs. The planning of activities should include a gender perspective to ensure that women and girls are not excluded. Subnational governments should reach out to the traditional media, for example through training and activities for journalists, and use their social media channels to communicate the SDGs directly to citizens. in schools, and direct work with parentteacher associations. • Informal education: youth groups, conferences, activities in museums or libraries, and online learning tools. Formal educational activities should be approved by the educational authorities of the country in which they take place. The LADDER project The LADDER project (Local Authorities as Drivers for Development Education and Raising awareness) is co-financed by the EU cooperation service EuropeAid. The project, which runs until 2018, will bring together 26 partners and 20 associates from both EU and non-EU countries, mainly local authorities and civil society organizations, to improve the participation of local authorities in EU policies and, in particular, to: •	Strengthen the capacity of associations of local authorities and civil society organizations to act in a sustainable way as the drivers for development, fostering their role as multipliers within their countries, communities and networks. •	Inform, raise awareness among and engage citizens in global issues, global interdependency and development education. •	Develop and reinforce cooperation between local authorities and civil society organizations. •	Develop innovative methods and tools in nonformal education addressed to a wide range of stakeholders (including educators, civil servants, NGOs, and youth leaders). In 2015, the project launched a successful initiative for children. The Slogan Competition aimed to raise awareness on development and foster development education among young people and in schools. The competition gave students the opportunity to think and express their concerns about development issues by creating inventive and meaningful slogans, videos and drawings. A total of 773 proposals were submitted, from which 34 were selected and 5 won prizes. UN Secretary-General Ban Ki-moon has appointed a group of 17 eminent persons to support him to generate momentum and commitment to achieve the SDGs by 2030.5 These SDG Advocates will engage with partners from civil society, academia, parliaments and the private sector to develop ground-breaking ideas and ways to promote SDG implementation. The group includes heads of state and government, business and political leaders, academia, as well as artists who have shown outstanding leadership in their field. To maximize their impact, awareness-raising campaigns and education strategies should be linked to national and/or territorial action plans for the implementation of SDGs. The role of local and regional government associations in mobilizing their members to achieve the SDGs Some local and regional governments may be unaware of their role in the 2030 Agenda, or fear that they are too small or lack the necessary knowledge or capacity (human, technical or financial resources) to contribute to the achievement of the SDGs. Local and regional government associations and networks should carry out awarenessraising campaigns to mobilize their members to understand their role in the achievement of the SDGs. They should seek to increase the knowledge and sense of ownership of the SDGs by all subnational governments, regardless of their size or level of resources, with the support of national governments and international organizations. Local government associations should make local and regional governments aware of their role in both the implementation of the SDGs and in the definition and evaluation of national and territorial strategies, as well as take steps to strengthen the institutional and operational capacities of their members. The awareness-raising and communication campaigns of local government associations should aim to build the commitment of local and regional institutions and other stakeholders to localize the 2030 Agenda, as well as to support their national and international advocacy work. SDGs The nomination of champion local and regional leaders who are actively involved in the achievement of the SDGs can be a powerful awareness-raising and mobilization tool for local and regional government associations. Calls for champions should be organized by national associations at national level and by the Global Taskforce of Local and Regional Governments at global and regional levels (Africa, Asia, Europe, Latin America, etc.). These champions should communicate the SDGs and the importance of localizing them. As pioneers in SDGs implementation, champions should promote the recommendations of this roadmap and share their experiences, ideas and perspectives in their communities, countries and worldwide at conferences, meetings, and public events. • A letter-writing campaign by local and regional governments to their central governments or ministers for foreign affairs to ask for recognition of the role of local governments in the achievement of the MDGs • The unfurling of white banners on local government buildings across the world bearing the slogan “2015: No excuse! The world must be a better place” Over a thousand towns, cities, counties and regions across the world joined the Millennium Towns and Cities Campaign directly and many more were represented by their national local government associations. National governments all over the world are launching SDG-based national development strategies or aligning their existing plans with the proposed goals of the 2030 Agenda. National associations of local and regional governments have an important task in facilitating the participation of local and regional governments in the development of these national strategies so that they reflect and respond to local circumstances, needs and priorities. Promoting local ownership of national strategies is vital. If local and regional governments have a sense of ownership of the SDGs and a role in determining their roles and responsibilities, their involvement in implementation will be greater. they contribute to the debate with a consolidated political message based on their knowledge and experience. If possible, local and regional governments should collaborate with universities and research institutes to gather the necessary evidence to support their advocacy work. THE SOUTH AFRICAN GOVERNMENT INVOLVES LOCAL GOVERNMENTS IN THE SDG PROCESS The South African National Ministry for Human Settlements has launched a review of the entire regulatory framework relating to integrated human settlements in view of SDG 11 on sustainable cities and human settlements. The country’s local government association, SALGA, will participate, throughout 2016, in a series of consultations with municipalities to inform them about the new policy and accompanying laws. SALGA has also contributed to the Africa’s position on the policies and priorities of Habitat III. Thirdly, the association works with the Ministry for Cooperative Governance and other key ministries on finalizing the Integrated Urban Development Framework to unlock the potential of South African cities. All the work carried out by SALGA focuses on ensuring that sectoral policies, such as policing or health, are sensitive to distinct local contexts in their approach and application. Call for an enabling environment for the localization of the SDGs In many countries local governments are agents of the central government and enjoy no self-government at all (they lack power, competencies and resources). The SDGs and their localization present a fresh opportunity to strengthen the decentralization agenda and promote new forms of cooperative governance (multi-level and multi-stakeholder). Local and regional governments and their associations should take advantage of the international commitment to localize the 2030 Agenda and call for reforms that give them clear competencies and create enabling environments in which to ensure effective local and regional development. National legislation and regulations provide the frameworks within which local and regional governments act. Such frameworks can create incentives or obstacles for sustainable development,9 especially in relation to local resource management, fiscal and financial decentralization, inclusive economic development and environmental protection.10 It is therefore essential that national local and regional government associations advocate for an enabling environment for the implementation monitoring and assessment of the SDGs at subnational level. •	Measures to monitor and assess the performance of local and regional governments, as well as to support them to improve over time •	A national urban strategy that takes the SDGs and the New Urban Agenda adopted at Habitat III into account, along with the financial and technical arrangements and capacities necessary to implement it Local and regional governments should call for their central governments to implement the “international guidelines on decentralization and access to basic services for all” adopted by the Governing Council of UN Habitat in 2007/2009.12 The Guidelines lay out the principles for the effective decentralization of responsibilities, policy management, decisionmaking authority and sufficient resources, including revenue collection authority. In 2005 the Commonwealth Local Government Forum (CLGF) adopted the CLGF Aberdeen Agenda: Commonwealth principles on good practice for local democracy and good governance. The principles provide a set of standards to promote healthy local democracy and good governance. They are intended to guide Commonwealth states on core principles for promoting local democracy and governance to ensure that local development is participatory and citizen-focused, benefits local people, and that citizens have a major say in their governance and development. The cornerstone of effective multi-level governance The example of South Africa, whose decentralization process started in 1994, is illustrative. The country is now one of the most decentralized states in Africa and its cities have large tax revenue bases. The clearest example: only 15% of Cape Town’s budget comes from central government grants.13 Cape Town’s good performance in service delivery incentivises the central government’s support and, compared to other countries in the region, state interference at the administrative level is limited, despite vertically-divided authority (that is, the ruling party in the city is the opposition at national level). Although much needs to be done in South Africa in terms of local empowerment, the country is, in this regard, well prepared for the localization of the SDGs. Call for fiscal reforms Without the strong commitment of national governments and the international community to reinforce the resources and capacities of local and regional governments, the potential of localizing the SDGs could be left untapped. As recognized by the Addis Ababa Action Agenda on Financing for Development, in more and more countries "expenditures and investments in sustainable development are being devolved to the subnational level, which often lacks adequate technical and technological capacity, financing and support.” 14 Local and regional governments should call for better local taxation schemes, including new taxes and non-fiscal resources such as rates and service charges, and for the weight of national transfers, especially conditional ones, to be reduced. They should stand up against taxes that are harmful for the environment, like fossil fuel subsidies. Local and regional governments should also work with central governments to improve their borrowing powers and to explore innovative forms of financing local government, including through partnerships with the private sector. Fiscal reforms are often part of a long and complex process, and the implementation of strategic projects to achieve the SDGs should not be postponed. The mobilization of existing available resources and capacities towards achievement of the SDGs at local level is essential. In 2014, the German association of cities, DST, drew up a Municipal Charter for the Future. The Charter gathered inputs from local politicians on local policies and practices relating to five dimensions of sustainable development: economic, ecological, social, cultural and partnerships. It became key input to the multilevel dialogue coordinated by the German Ministry for Cooperation that drafted the Charter for One World: Our Responsibility in 2015. DST nurtured the preparation process of SDG consultation of the German government, leading to strong ownership of “cities perspectives” by the Ministry for Cooperation. FEMP has urged the Spanish government to create a “multilevel coordination committee” at national level that recognizes the 2030 Agenda as part of national policy in order to ensure its effective implementation. Furthermore, the federation has joined with other European associations, such as the Italian association of municipalities, to raise public awareness of the SDGs, as part of the EU DEAR programme. The FEMP’s strategy is to raise awareness, make commitments and build alliances around the localization of the SDGs. This target will be translated into training, compliance instruments, and evaluation and monitoring tools. The National Confederation of Municipalities of Brazil (CNM) The CNM and UNDP, through the ART Initiative, are partnering to strengthen the role of municipalities in the localization of SDGs. This joint initiative seeks to raise awareness among local governments of the 2030 Agenda, to enable them to integrate the SDGs into their local plans and to build monitoring and accountability systems at the local level. Activities include: identification of relevant indicators for municipalities; the drawing up of guidelines and publications on the role of local governments in the new development framework and capacity building of new elected mayors in the implementation and monitoring of the SDGs. The participation of local and regional governments in the definition of national priorities and strategies relating to the SDGs requires an appropriate institutional framework that allows for different forms of cooperative governance involving both different levels of government (multi-level governance) and other stakeholders (multi-stakeholder governance). Local and regional government advocacy aimed at national governments and international organizations should call for multi-level governance mechanisms to better facilitate the localization of the SDGs. Multi-level governance has been described as the â&#x20AC;&#x153;decision-making system to define and implement public policies produced by a collaborative relationship either vertical (between different levels of government, including national, federal, regional or local) or horizontal (within the same level, e.g. between ministries or between local governments) or both.â&#x20AC;? 15 The success of multi-level governance is determined by three conditions: the principle of subsidiarity, respect for local autonomy, and mutual loyalty, trust and structured dialogue between actors. An integrated multi-level governance approach and dialogue between interdependent institutions can be achieved through mechanisms based on consultation, coordination, cooperation and evaluation, for example, the establishment of a formal committee that brings national, regional and local authorities together, structured dialogues, partnerships, and informal networks. Local leaders play a key role in negotiating successful multi-level governance on behalf of their communities. COLOMBIA: MULTILEVEL DIALOGUE FOR THE SDGS In 2015, the Government of Colombia created the High-level Interinstitutional Commission for the Preparation and Effective Implementation of the Post-2015 Development Agenda and the SDGs. The Commission seeks to be the formal arena of monitoring and decision making on public policies, plans, actions and programmes relating to the implementation of the SDGs. prosperity. Colombia has even aligned SDG initiatives with the Presidentâ&#x20AC;&#x2122;s Office in order to ensure commitment at the highest level. Local and regional governments, as well as ministries, civil society organizations, academia and the private sector are invited to participate in the Technical Committees and Work Groups of the Commission. All these institutions will contribute to the readiness, ownership and commitment to implement the SDGs under the guidance and coordination of the Commission. IMPLEMENTATION: THE SDGS GO LOCAL! Local and regional governments should make choices and prioritize those goals and targets that best respond to their specific contexts and needs. Conducting a needs assessment to define priorities and localize the SDGs The implementation of the SDGs should both respond to local and regional needs and priorities and be coherent with, and complement, national strategies. The role of different levels of government in the implementation of the SDGs depends on the political and institutional framework of each country. Each level of government should have the capacity to set their own priorities in line with their legal areas of responsibility, and to pursue them through local and regional plans and sectoral policies. In order to set local priorities, existing local and regional programmes should be reviewed with the aim of identifying the main needs, priorities, gaps and cross-sectoral linkages of the territory and their relationship with the SDGs and national priorities. It is crucial that local and regional governments ensure their priorities within the framework of the SDGs are relevant and locally-owned, and include the interests of different levels of government and local stakeholders, including minorities and vulnerable groups. The establishment of SDG working groups or task forces is one promising way of connecting departments (or ministries for regions) with local and regional government bodies. These groups are usually led by the mayor or president in order to mobilize the interest and commitment of all departments and institutions. Cooperative governance to establish shared priorities National governments should mobilize and engage local and regional institutions and stakeholders in a dialogue on the priorities that should be addressed by the SDGs. The following governance mechanisms should be activated to make this possible: Multi-level governance platforms should ensure coherence between the sectoral priorities of national government departments and those of local and regional governments. Inter-municipal cooperation, including crossborder cooperation where appropriate, should be used by local governments to jointly assess their needs, define their SDG priorities and develop programmes and plans at territorial level. Local and regional governments should work together to guarantee a more integrated and efficient approach to territorial development through cooperation in service delivery, infrastructures and, where possible, through the pooling of resources and capacities. Peer learning and teamwork can be an effective way to improve service delivery, change working methodologies and promote problem-based learning. For local and regional authorities of similar backgrounds peer learning is a mechanism to encourage one another and improve their political and technical decisionmaking and performance. Multi-stakeholder mechanisms, both formal and informal, should ensure the participation of civil society organizations, private companies and academia. These mechanisms should be: accessible to all sectors of society, balanced so that no group dominates any other, and transparent. When everyone has the chance to contribute to the debate with their opinions, information and experience, the process gains legitimacy, but decision-making must be transparent and widely communicated to ensure that the process is accountable and confidence is maintained. Where possible, existing participation mechanisms should be used for the definition of SDG priorities, rather than ad hoc processes; standing institutional arrangements allow the capacities of civil society representatives to be strengthened over time and trusting relationships of support and cooperation to be developed.16 Local and regional governments should play a leading role in multi-stakeholder mechanisms, while respecting the independence of nongovernmental actors. 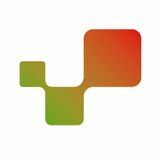 This role could include: ensuring a minimum infrastructure, setting agendas, proposing specific topics, distributing relevant materials or even awarding grants for particular activities. REGIONAL PLANNING AND SDG ALIGNMENT IN WALES (UK) The National Assembly for Wales passed the Well-being of Future Generations (Wales) Act in 2015, the main mechanism by which Wales will contribute to the achievement of the SDGs. The Act puts into law seven well-being goals for Wales based on the principles of sustainable development. These goals reflect the economic, social, environmental and cultural dimensions of sustainable development in Wales. This holistic strategy sets out a comprehensive plan, including indicators and follow-up mechanisms for public bodies and government long-term planning. The Act also establishes the role of a Future Generations Commissioner for Wales and aligns accountability for achieving the goals with the public sector’s overarching purpose. The 2015 Act includes a requirement for Welsh ministers to take account of any action taken by the United Nations in relation to the UN Sustainable Development in their planning for the future, and to assess the potential impact of such action on the economic, social, environmental and cultural well-being of Wales. In a context of scarce resources, local budgets should be efficiently aligned with the priorities identified and established in the local or regional development plans. This implies allocating or reallocating available resources to satisfy priorities aligned with the SDGs. It is also important to improve management skills and capacities within institutions to ensure a more effective use of available resources. This includes improving organization schemes, tax management, budgeting (including participatory budgeting), public procurement, transparency and the fight against fraud and corruption, as well as providing new and enhanced skills in local and regional government staff through capacity building initiatives in fields as diverse as public debt management and access to private loans. STRENGTHENING CAPACITIES TO MOBILIZE LOCAL RESOURCES IN ELMINA (GHANA) The city of Elmina has piloted a new project that aims to improve the local governmentâ&#x20AC;&#x2122;s capacities in taxation. The toolkit, developed by VNG International, includes activities to strengthen capacities in finance and investment, perform local legal and organizational assessments, commit to high management and transparency standards, and hold information campaigns to involve local stakeholders and explain what they are paying taxes for. The pilot project in Elmina had very positive results: comparing the local tax results of 2014 and 2015, the amount of properties assessed and taxed nearly doubled, the taxable value increased by 11 times, and the total amount collected grew twentyfold. New partnerships are also needed to mobilize resources and expertise by partnering with the private sector (through public-private partnerships), communities (through publicprivate-people-partnerships) and universities and research centres. Alternative finance channels should not be neglected: crowdfunding, for instance, raises funds through small contributions from diverse individuals and organizations. Local and regional governments should also consider working together to pool their services. Whether through informal mechanisms (such as a joint strategy by municipalities or regions to attract new businesses) or through more complex institutional forms of collaboration (ad-hoc associations, consortia, etc. ), such intermunicipal cooperation can free up extra resources by harnessing the cost advantages of economies of scale. A lack of resources and capacities is particularly critical for many intermediary and small cities and rural municipalities and regions. For this reason, regions and intermediate governments play an important role in scaling up high value services and providing technical and financial support in the framework of territorial cooperation mechanisms. IMPROVING COORDINATION BETWEEN REGIONS AND MUNICIPALITIES IN SANTA FE (ARGENTINA) The regional government of Santa Fe has developed strategic planning in partnership with its intermediary cities to promote instruments for local planning that are supported by regional policies. The region is characterized by huge imbalances between urban and rural territories. Santa Fe has a strong agroindustry, and the government is interested in preventing conflicts on land use, on labour standards, looking for a diversified economy and entrepreneurship. Santa Fe’s strategic plan was built in a participatory way (with civil society and local authorities) and public administrations are subject to citizen scrutiny that requires new management tools for the implementation of 346 projects. • In November 2012, supported by the UCLG and UNESCO Catedra on Intermediary cities, the region called on its intermediary cities, political and technical leaders to apply “Plan Base” an instrument for basic mapping and decision making in order to review and better regulate urban growth and public spaces in a scenario that limits urban expansion. Santa Fe developed regional policies to enable the plans to be implemented. Currently, 30 intermediary cities are applying the mapping methodology. • In April 2016, supported by UCLG and International labour organization, ILO, the region, together with some international and regional partners, reviewed its policies on territorial development, economic growth and decent work. The decent work agenda integrates into the local basic maps, and will be joined up with regional policies for monitoring labour and social protection. ILO is supporting the government of Santa Fe in the decent work agenda so that SDG8 will be more inclusive to local governments. Promoting ownership and co-responsibility for the implementation of strategic projects The implementation of the strategic projects included in SDG-based plans (or aligned plans) should promote the full involvement and participation of local stakeholders (NGOs, private sector, community-based organizations, research organizations, academia and individual citizens). This multi-stakeholder approach should create ownership and co-responsibility among all actors and serve to mobilize and reallocate resources effectively. Over the last decade domestic resources have been the largest source of financing for development,19 and CSOs, the private sector and academia have a significant capacity to mobilize, not only financing, but also technology, innovation and talent for sustainable development. While the stakeholders have different interests, expectations and agendas and play different roles, they have a common goal in the sustainable and inclusive development of their territories. Their contribution through different phases (definition, funding, implementation, monitoring and evaluation) should be defined according to their capacities and resources (technical, technological and financial resources, knowledge-based skills, and innovation). In order for local and regional plans to accurately reflect local needs, public institutions should promote the involvement of citizens, particularly the most vulnerable groups, through mechanisms that facilitate their participation. When citizens are involved in the planning stage of a plan or project, they are usually keener to participate in the implementing and monitoring stages too. The diaspora can play a crucial role in development, with remittances serving as a powerful financial instrument to achieve SDGrelated projects at local level, especially in the fields of housing, health or education. In addition, diaspora may contribute with trade, technology and knowledge, also essential for the development of local projects. Harnessing remittances requires local understanding and commitment to action. OWNERSHIP AND LOCAL RESOURCE MOBILIZATION IN NIGER AND ALBANIA Evidence from Niger shows that citizen ownership and co-responsibility were essential in the implementation of the MDGs. Citizens of Niger were willing to pay local taxes when resources were allocated to projects that aimed to overcome needs that had been jointly identified and incorporated into development plans by the local governments and citizens. Decentralized cooperation partnerships are an optimal way to build platforms for local and regional governments to exchange knowledge and experiences, provide technical assistance, link societies together and generate exchanges among citizens, CSOs, the private sector and universities. THE PRINCIPLES OF EFFECTIVE DEVELOPMENT COOPERATION APPLIED AT SUBNATIONAL LEVEL International Cooperation Guidelines (ICGs) are a tool that can help to align local or national plans with development cooperation. ICGs cover territorial priorities and needs and provide international cooperation partners with an action plan drawn up at local level. ICGs pave the way for donors and partners to respond to the demands of territories and enhance transparency and collective efficiency through common working frameworks that offer joint diagnoses, guidelines and strategic projects. With the support of UNDP, ICGs have been produced in a number of countries. For instance, in Nariño, Colombia, territorial working groups contributed to define the department’s development priorities and translate them into guidelines for cooperation partners. A similar strategic planning exercise took place in Lebanon with the Dinnieh Working Group, and in Mauritania, where two of the country’s Wilayas have developed guidelines with a gender approach. DECENTRALIZED COOPERATION TO ACHIEVE SDG 8 ON DECENT WORK AND ECONOMIC GROWTH In 2012, in the framework of the localization of the decent work agenda, the ILO, UCLG and the city of Maputo organized a learning exchange in the Mozambican capital about the informal economy, particularly the conditions of informal vendors. The main guests were the cities of Durban, Belo Horizonte and Porto Alegre, who had the opportunity to share their extensive experience in the field. Other Mozambican cities, international organizations, NGOs and the private sector were also invited. The learning exchange resulted in the adoption of a roadmap on South-South and Triangular Cooperation for local governments and was followed by a series of technical visits and training sessions in 2013. Durban transferred its experience to informal vendors and municipal officers, while Belo Horizonte shared its expertise on the support of local economy and urbanization. The exchange demonstrated the strategic importance of food markets for local economic development, poverty reduction and cultural diversity, as well as the need for a local government South-South cooperation program. Since then, further peer-learning projects have been held in Barcelona, Lleida, Chefchaouen, Pasto and Borgou. The SDGs will be monitored and assessed through a system of 231 indicators. Many of these indicators can be localized by gathering data at territorial level. Many local and regional governments lack adequate mechanisms to gather information and data at territorial level and local data sets are often not consistent with national data collection systems. However, there are examples of cities and regions that have created their own statistical institutions to complement planning services. Strengthening these institutions will be essential in order to monitor and assess the achievement of the SDGs at territorial level. Promote the participation of local and regional governments in national monitoring Most countries’ monitoring systems are administered by a national statistical office or national planning service. In other countries, the systems are the competence of an intersectoral commission or council made up of representatives of different ministries. In either case, local and regional governments should seek to take part in the national follow-up and review of the implementation of the SDGs. The follow-up process should be transparent in order that its results serve to hold local and regional governments and other participating stakeholders accountable and to harness the best experiences to transfer knowledge to other municipalities, regions or countries. FOLLOW-UP OF SDG 16 ON PEACE, JUSTICE AND STRONG INSTITUTIONS “AT ALL LEVELS” A successful initiative to monitor SDG 16 has been promoted by UNDP in 5 pilot countries. The information to construct a partial baseline, for instance, is already available in Rwanda (through its scorecard), Tunisia (through perception-based data collected as part of its governance, peace and democracy survey), and to some extent in Albania (through previous experience with implementing its MDG 9 on good governance. Rwanda can provide additional information through the completion of its 2015 Citizen Report Card and gender audit for justice, reconciliation, law and order, to feed into its own upcoming baseline study, and the UK has mapped existing available data sources for SDG 16. One of the important lessons from the MDGs was that progress should not only be tracked at national level. The UN has undertaken a special effort to make monitoring at local and regional level a priority in case of the SDGs. The definition of local or regional SDG plans, or plans aligned with the SDGs, should include a set of indicators linked to those of the 2030 Agenda and adapted to each territory’s needs and context. Local and regional governments should define these indicators according to their data collection capacities, including their human resources and technological facilities. The establishment of data collection systems at local and regional level is a fundamental in order to disaggregate information “by income, gender, age, race, ethnicity, migratory status, disability, geographic location and other characteristics relevant in the national context” (SDG Target 17.18) and to monitor processes and results through indicators. Cooperation agreements should be signed by different levels of government to ensure the exchange of information. A ‘data revolution’ should be promoted to contribute to the monitoring and achievement of the SDGs. Again, universities, research centres, and even NGOs and the private sector, can help in the task of collecting, monitoring and analysing data. Indicators should also take into account the diversity of territories. Thus, in line with the SDG motto of “leaving no one behind”, they should include social groups at risk of exclusion (that is, groups that usually fall far below the average indicators). Similarly, countries with special circumstances such as fragile, conflict-affected, landlocked or less developed countries or small islands might need to include additional indicators to better reflect and monitor their specific circumstances and needs. As for the monitoring and evaluation of local or regional plans, local governments should set up joint initiatives to create strong subnational mechanisms supported by independent review processes. When resources and capacities do not allow for the creation of subnational mechanisms, local and regional governments should ensure that the national authorities collect data from all the different territories in a comprehensive manner. the University of São Paulo, the State University of Campinas and the São Paulo State University Júlio de Mesquita Filho, and four representatives appointed by the governor, one of whom is from a private public opinion research body. SEADE and the Secretary for Planning and Management have been publishing yearly monitoring reports of the MDGs in accordance with the indicators previously set in the planning stage aiming to analyse the progress made towards the goals in the federal state and contribute to their attainment. WHERE DO WE GO FROM HERE? This roadmap is just one step in the journey of the Global Taskforce of Local and Regional Governments to support subnational governments and partners to localize the SDGs and achieve inclusive and sustainable development for all. We hope that the international community, national governments and civil society will join us in working to localize the 2030 Agenda across the world. Going forward, it is essential that the awareness-raising, advocacy, implementation and monitoring of the SDGs at local level, particularly for SDG 11 on Sustainable Cities and Human Settlements, is linked up with the New Urban Agenda adopted at Habitat III. This is essential in order to harness both agendas effectively and avoid confusion, overlaps, or gaps in action on the ground. We invite all local and regional governments and their associations to freely use this material to support their work in achieving the SDGs. We also invite local and regional governments to join their national associations and support the work of the Global Taskforce on localizing the SDGs and linking the 2030 Agenda up with other international agendas in a way that makes sense in our cities and territories.